At our dental office in Manchester Center, your new patient exam is a very important visit. If you did not print the necessary paperwork and complete it before your appointment, please plan on arriving 10 minutes early to do so. You will then be escorted back to the treatment area by our dental assistant, who will review your medical history and any major dental concerns that you have. Your blood pressure will also be taken at this time to have a baseline. A review of your existing records from your former dentist will have been acquired, and any supplementary data will be gathered in the form of new X-rays, study models and photographs. 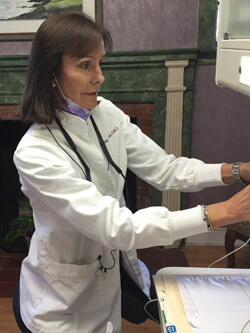 Dr. Cech will then perform an exam of numerous areas, including your head/neck, the soft and hard tissues of the mouth, and the relationship of upper to lower teeth. This exam will also include the jaw joints (TMJ), gum tissue, an oral cancer screening, and a dental exam. A cosmetic dental consultation may also be part of the overall exam. In conclusion, Dr. Cech will present findings at this visit and recommendations for any dental concerns. If further data is needed, she may suggest an additional appointment and a consultation. You should leave this visit with answers to any pertinent questions you may have and with an additional appointment for your dental hygiene visit. Instead of having to wait until you reach our office to fill out the necessary forms, patients can now do so in the comfort of their own home! Just follow the links below to download and print out the paperwork. By being able to fill in the correct information on your own schedule, you’ll be able to start your first appointment with Dr. Cech that much faster. Here in Manchester, Dr. Cech’s goal is to provide high-quality dental care that isn’t needlessly dictated by your insurance company. Our team will personally file paperwork on your behalf to ensure you receive your plan’s full benefits, and we’ll also discuss alternative options of financing to cover the remaining cost of the services you deserve. No insurance? No problem! CareCredit is available for patients in need of affordable monthly payment plans that come with little to no interest. Now, in-depth procedures, reconstructive care, and even purely elective cosmetic treatment can be broken down into predictable, manageable chunks that make it easier than ever to transform your smile.